I really like trees. 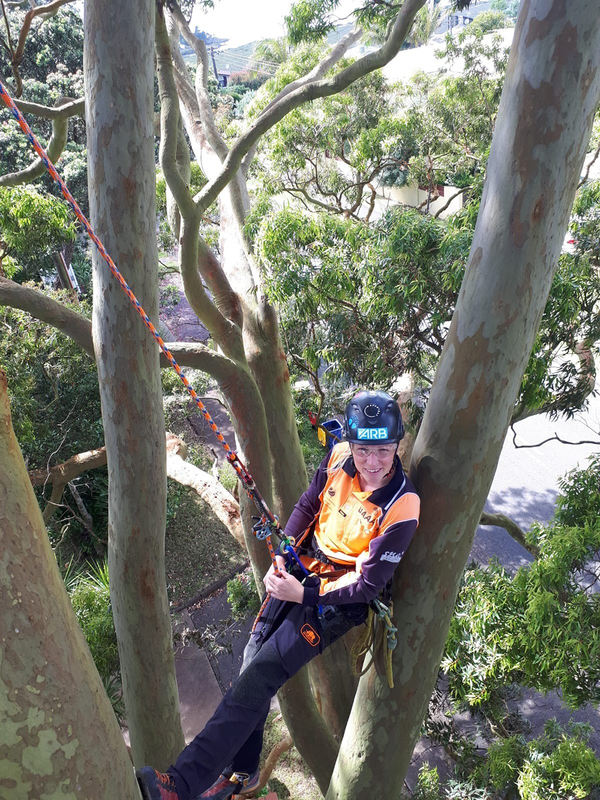 I’ve travelled around Australia and the world climbing trees and competing in tree climbing championships, and have enjoyed getting to know some of the many that share a passion for the trees and urban forest. Why did you choose arboriculture? I am interested in the natural world but was particularly interested in trees and their role within ecosystems and importance for humans. I started reading about cool trees from around the world and then discovered there was a profession that involved caring for trees. Once I found out that you could literally climb trees and study them, I enrolled into the next arboriculture course at my local training provider. There’s something really satisfying about doing something that I am interested in, that is unusual to most people, and that requires a really cool and unique set of skills. I think trees deserve to be treated with respect, particularly the elders in our community. They are long-lived and people have trouble comprehending their needs. I try to translate on their behalf. They can become hazardous infrastructure if not managed well so taking a holistic, sympathetic approach to them is important. This is a skill I have been cultivating so I can do the best I can for them. The sum of experiences I have had within the arboriculture industry that has led me to work with such a world-class and amazing team in urban forest and ecology at the City of Melbourne. Starting on the tools with a commercial company then moving on to climbing within the private sector, then off to the Royal Botanic Gardens and consulting, moving interstate and to the UK to experience the same problems but with different solutions, climbing competitions and tree climbing around the globe with the world-wide tree tribe, to finally arrive back in Melbourne to work in the Urban Forest & Ecology Team.. It all seems quite surreal. I’ve worked hard in this industry and that has lead to the reward of being able to work with such talented people and remarkable trees. How can we encourage women to join our profession? Most women have been told from a young age that they don’t belong in this type of profession. Actively encouraging and asking women to be involved will overcome some of the boundaries that prevent women from trying in the first place. Start with kids and show girls that they are allowed to do this. Actively promote arboriculture as a place for women, personally inviting and encouraging women into arboriculture, and welcoming women to make arboriculture an inclusive place. I’m honoured to be interviewed by the ICF because it demonstrates the active support and promotion of women in the industry which, in turn, encourages more women to participate. Encourage an inclusive attitude, and keep an open mind to people’s differences. Being conscious of what ICF is actively promoting (in publications, on the website, etc) and proactively engage and invite a diverse range of people when organising events. Where diversity is demonstrated at a high level, this will generally flow back down into the workforce. Male leaders in various industries have signed up to programs such as Champions of Change, whereby they pledge to use their influence to elevate women: https://malechampionsofchange.com/. Trade magazines with barely clothed women on the front, rude calendars on the wall in the office, people getting away with sexist jokes in the workplace – all those things matter. Women will choose an industry that they feel welcomed and equal part of. Not everyone wants to go to work and fight for gender equality every day. It’s exhausting. Family leave and part-time roles is a big one for women because they typically bear the burden of having kids, taking a career break and then transitioning back to work. Supporting work-life balance is good for women and men. That’s assuming you can get women employed in the first place, of course. But things like that can be advocated for. How can we support women in forestry and arboriculture? Recognise the different challenges that women have on a day-to-day basis and give women a safe forum to discuss these challenges with each other. Understand that women will need a larger portion of the attention before things can settle back to being equal. For instance, promote images or videos of women using chainsaws and climbing trees more often than showing men, make it normal to see women there. Take our skills and competency seriously and show women as champions with the men, not as separate from the men. Put women on the same platform, give women the same wage and prize money in competitions, and give women the same opportunities to succeed. It feels like there are people already making differences ie. protective clothing and gear specifically designed for women, and this is really awesome.